One of the things I really love about spindling is that there always seems to be more to learn. I came across yet-another-new-to-me spindle type recently, the Dealgan. So, what's a Dealgan? It's an 18th century Scottish spindle. A little piece of wood, really, about 5-6" long with a knob at the skinny end and a bulb at the far end, with a flat bottom and an X cut into that flat bottom. My first contact was the information provided by Lois Swales of Missing Spindle, who posts about them on her blog, sells reproductions on etsy, and has several handy YouTube videos for exploring this historic spindle. She's been out for a while, though, so I looked to NiddyNoddyUK (also on etsy) for one. Now, if you've looked into spindle shape at all ... 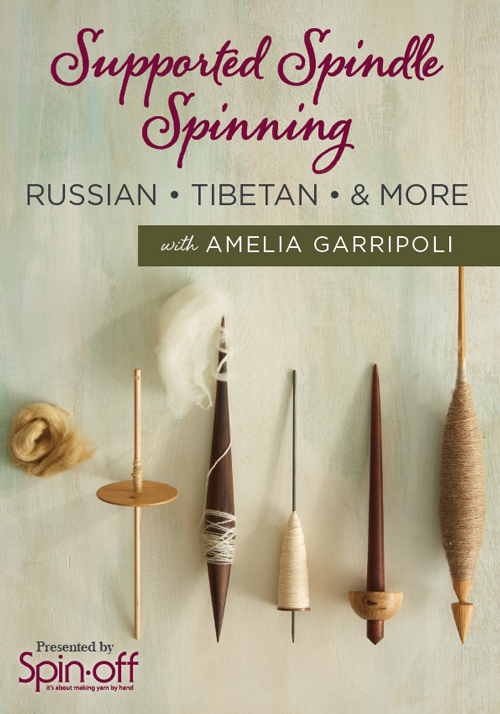 Okay, if you haven't go and read Which Spindle Spins the Best? on this blog, I can wait. So, now you know that you want rim weighting and a skinny shaft - neither of which are evident on the Dalgean. It won't spin for a long time, and generally won't go that fast with a flick, so it's best suited to spinning in limited space (seated, perhaps) and medium thickness of yarn. I've been experimenting with lap spindle techniques and drop spindle techniques, and funnily enough I seem to get the most speed by twirling it from below with all my fingers, rather than trying to flick the shaft with my thumb and index finger. I plan to keep exploring, and look forward to trying out plying. Why this shape and size, then? Portability, durability, utility. All are possible. It's one sturdy piece, so it can be dropped, tucked away, or even thrown with little chance of harm coming to it. It forces you to wind a sturdy ball similar to that wound on a nostepinne, and the conical shape means you can pop the ball off when you are done. That reminds me of a very interesting question asked on an Ask The Belwether post on Facebook: why wind a plying ball if the yarn comes off your Turkish (and Dealgan!) spindle as a ball? Two reasons, really: one, you can deal with singles management separately from plying this way; two, you can use speed plying techniques such as the Andean hand-roll with a Turkish, Dalgean, or other bottom-whorl spindle, or a kick-ply with a top-whorl. Yes, I was tickled pink to find out that Scottish plying is also done from a two-strand ball. The other spindle the Dealgan reminds me of is the little Victorian silk spindle Bette Hochberg drew in her book Handspindles, made popular by Hatchtown, Will Taylor, and my own Natalie spindle. Those are one-piece spindles with their mass at the top. It's funny the way spindle shapes keep showing up in different places. 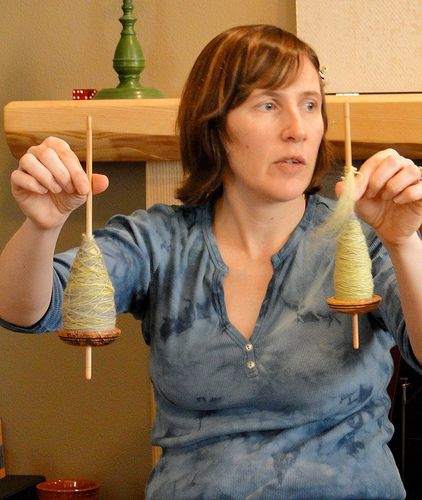 I always remember that the goal of these tools is the same: creating yarn for textiles. The Dealgan is clearly a historical spindle. I find it an interesting spindle to explore, and am sure that it will enrich my spindle-life as I experiment with it and find what it can and can't do. And, at a pinch, I may even re-explore one of the early Spindlers' threads on spinning with Mexican cocoa frothers and honey dippers. Next, though, I plan to spend some more time spinning on rocks. No, really. I've done it before but want to give it a more serious go this time, fill a rock or two and then ply. It's something I recommend to my classes: don't give up on a tool or technique until you've tried at least a spindle-full, plied, with it. And I didn't follow through with my rock spinning, even through I did enjoy it. Definitely worth revisiting. What's the oddest spindle you've spun with? perhaps we will explore some of my odder spindles, in future posts. Until then, here's another one to consider: Can You Spin a Sheep? What's it like to shoot a video? I am absolutely thrilled to announce that there are now two more spindle videos available to spindle afficionados around the globe. These two are special for me - because I'm the one in them! Woot! 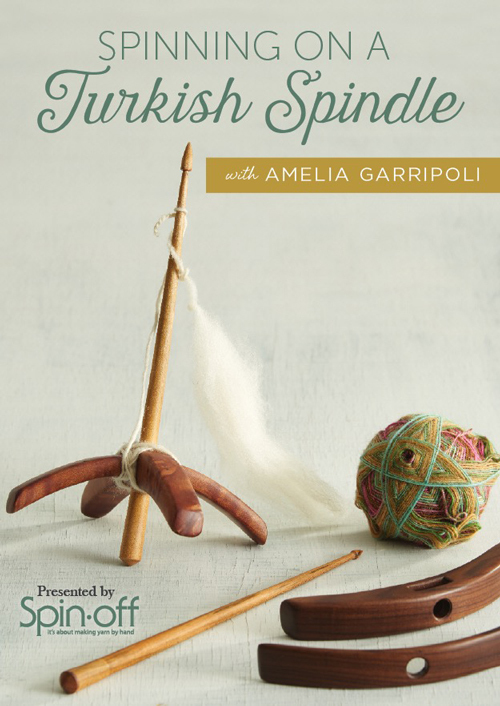 That button above will take you to Interweave's store, where you can find "Supported Spindle Spinning with Amelia Garripoli" and "Spinning on a Turkish Spindle with Amelia Garripoli". Yep, that's me - my name in lights, Ma! It is available as a DVD and as a Video Download. Yes, I do get royalties on purchases; and they also showed me how to sign up as an affiliate, so any Interweave purchase you make through the link above gets me a percentage also. How cool is that? But, back to the original question. What was it like? Exhilarating. Excruciating. Extreme. I've actually been in front of a camera quite a bit, but there was a room of students at the time (my other job since 2014, as faculty at a local community college). However, this time, it was different. In my head, it was different. I haven't quite nailed down the reason (care to conjecture - I'm open to ideas of the cause). My thought was that the DVD is somehow more permanent than taping a class that will be gone once final exams are completed. The equipment was definitely quite a bit more extreme than my webcam setup at the college. Impressively so. And the studio was definitely more polished than our classrooms - state of the art equipment, but no interior decorating in sight, on campus. The crew at F&W/Interweave was wonderful - Jill, Leslie, Anne, the camera guy (Oh, I am bad at names! ), the makeup lady, and the chocolate lady - very supportive, helpful, and wonderful to work with. I was impressed at how quickly things got resolved when we had to nail down a video timeline, how well they edited my course outlines to make them flow for the recordings, and how smoothly the day went. I felt valued, and was thrilled to be putting some of my knowledge into this medium. I pick up bits and pieces here and there, put them together into cohesive ideas and methods, and love sharing them with others. That's why I teach - I don't want what I learn to end with me. Do you have muddy tips? My favorite "tough fleece" cleaner is Louet's FiberMaster [I bought lots of this; if you can't find any, Unicorn Power Scour is good, too]. 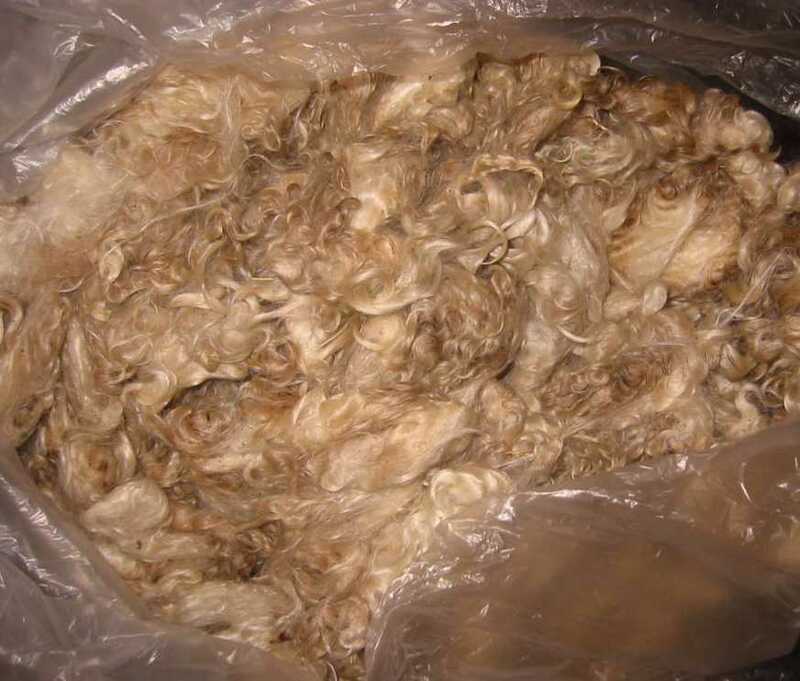 I don't use it for just any fleece -- most fleeces come clean with either self-fermenting cleaning or a milder cleaner like Sodium Laurel Sulfate. SLS is the primary ingredient in cheap shampoo, and sold on its own in feed stores, in the horse aisles. I had a particularly dirty/gummy Targhee fleece a few years ago, and FiberMaster didn't work, so I thought I'd step it up and try some Borax and detergent. Bad idea -- that combination was very pH basic, and it not only ate the finish off my new granite sink, it also broke the fleece. Lots of fluffy clean locks (it did clean it!) that now break when you tug on them. Sigh. The fleece now lives in my "what not to do" samples on fleece washing. If I need to get it done quickly, I'll try to pre-soak it overnight in tepid water and then use Louet FiberMaster to wash it. 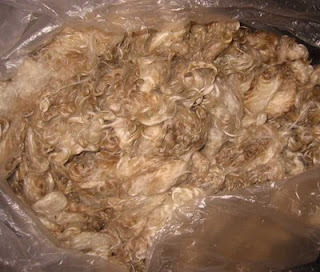 I've discussed this type of fleece washing before in "How do I wash raw fleece?" If I have time, I will use the suint washing method, letting it sit in its own water for several days. 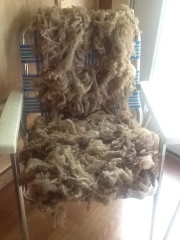 I discussed this process on some fleeces before in "Slow Wool". Lara's Dorset Tips - muddy! 1) put a few locks in a sink of hot soapy water, put on my extra-hot-water-protection gloves, and rub the tips while they are submerged. This usually works, but involves alot of under-water rubbing, which takes time, as each lock is rubbed on its own. When you keep them all submerged, and don't over-agitate, this is unlikely to cause matting. 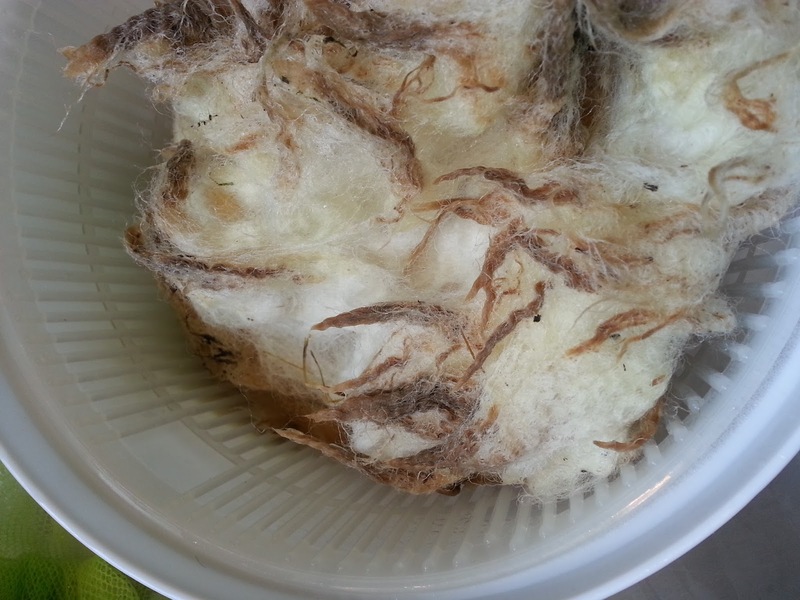 2) once it's dry, pick open the fiber, with a wool picker. These are beasts, so you might ask around before you run out and buy one. Your guild or a fiber friend may have one you can try. This is usually pretty effective at opening up the tips after the first wash. Once it's all picked open, I will re-pick any that didn't open, or flick-card them open if there aren't too many, and rewash the fleece to get out that now-accessible dirt. 3) once it's dry, flick the dirty ends. This is time intensive as it, like the first, is done lock-by-lock. However, it will open the ends, and will also show you if the tips are weak. I often find that muddy tips are also weak tips. All that weather weakened their ability to shed the muck, and that seems correlated to their strength. 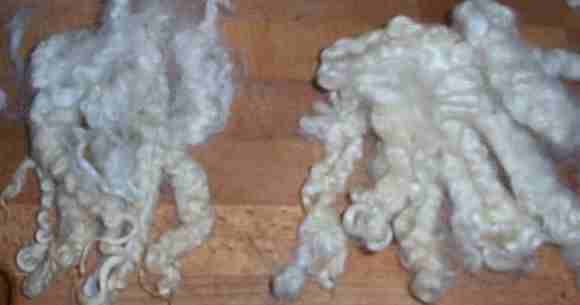 Like the second method, you will need to re-wash the fleece after doing this, to remove the dirt that remains on the individual fibers. Beth Smith (author of The Spinner's Book of Fleece, fiber artist, author and teacher) recently posted about fleece washing, she has some good tips on fleece washing (sorry for the pun! ), and consistently gets good results: "Wool Scouring - Simple and Mostly Quick".